Gear is the tools that helps us realise our musical dreams. There is bad gear, good gear and great gear. One of the things that defines greatness in my book is longevity. Great gear grows with you. My Eden cxc110 bass combo springs to mind. It’s a wonderful amp with so much thought and flexibility built in to the design, it’s been useful in ways I never imagined when buying it 12 years ago. Another was my Sony CD Walkman D-NE711 bought long before iPods and smartphones became popular. As well as regular audio CDs, it can play a data CD of mp3 encoded songs – no need to carry around a wallet of audio CDs. A big deal in the Nineties! It could resume from stop at any time, ideal for audio books. Old tech cassettes did this by default, but most new fangled CD players did not. And rechargable batteries charged automatically when the Walkman was plugged into the AC adapter. Perhaps old hat now, but I still use it nowadays to verify CD-Text song titles from test CD masters. There’s something reassuring about doing this on a hardware device completely disconnected from the Internet. Recently I bought an Avantone Mixcube, an active speaker that sounds like low quality ones in televisions, clock radios, smart phones and so on. 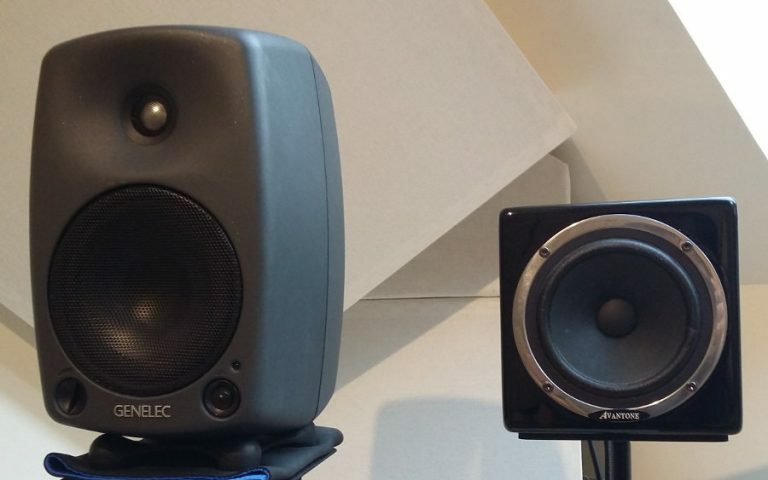 Flipping between it and the main studio monitors when mixing helps ensure the mix translates well to all devices, good and bad. The high quality, overpowered, single driver, sealed enclosure design allows you to make mixing decisions you couldn’t depend on from a cheap consumer speaker. Most of these cheap speakers are actually mono or so close together they might as well be, so it makes sense to use a single Mixcube for this purpose too. Then I remembered my Behringer ADA8200 Ultragain. I use it to add another 8 mic preamp inputs to my audio interface via ADAT. It also has 8 XLR outputs, not currently in use… I connected the BMC-2 ADAT out to the ADA8200 in, and an XLR cable from ADA8200 output 1 to the Mixcube. Success! Sound was forthcoming, completely independent of the ADA8200 inputs, with audio interface, ADA8200 and BMC-2 in digital sync! Of course it only contained the left channel (the right was going to channel 2). But the BMC-2 has a button next to the ALT selector that sums the stereo signal to mono in both channels. Problem solved, and without compromising any existing functionality. I know it’s all in spec and proper, but I still get a buzz when this happens. And on this note I am delighted to welcome the TC Electronics BMC-2 and Behringer ADA8200 into my personal pantheon of great gear.